Curved design easily cleans between back teeth and hard-to-reach places. 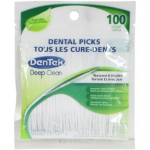 GUM Soft-Picks Advanced are disposable dental picks with soft rubble bristles that gently massage and stimulate gums. GUM Soft-Picks Advanced have a longer and curved-shaped handle to allow you to simply and comfortably clean between back teeth and other hard-to-reach places. These easy-to-use between-teeth cleaners also have a sturdy handle for a controlled grip when cleaning around crowns, bridges, implants, dentures, and orthodontic appliances. 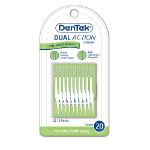 The flexible and tapered synthetic rubber bristles fit easily between most teeth, removing dental plaque where gum disease often starts and toothbrushes alone cannot reach. Each package comes with an on-the-go travel case for convenient use anytime, anywhere.